I’m always interested in books that try to incorporate mythology or folklore into the story. I’m obsessed with all things Irish, and I’ve never read anything about banshees in fiction, so I was excited about this book. 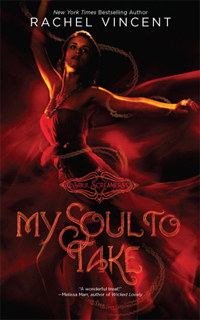 My Soul to Take had a fantastic concept - bean sidhes (more commonly known as banshees) - but I thought the book dragged quite a bit. But, like I said, I thought it had a fantastic concept. I loved the twist and new ideas about bean sidhes, and thought the idea of grim reapers was terrific and fresh, and added more depth to the story. The mystery of the girls’ deaths kept me curious throughout, and I was shocked in more than one place, especially the ending. I enjoyed the relationship between Kaylee and Nash, but it annoyed me after awhile how Kaylee couldn’t do anything without Nash there. She had to know he was within reach, feel him at her back, be touching his hand, etc. I realize that he brought her a lot of comfort and that she was going through a lot and it must have been scary, but it just seemed like it could develop into an unhealthy, dependent relationship. That being said, I did think they were sweet together, and I thought Kaylee’s feelings were realistic and relatable - at first wondering why the hot guy wanted her and what his ulterior motive could be, and then just trying to figure out their relationship. They worked well together, and not just because of what they had in common; Nash grounded Kaylee in more ways than one, and I liked watching their relationship progress. I also liked how there was no beating around the bush with their relationship - it was straightforward and simple - I like you, you like me, let’s be together. No waiting and wondering, no second-guessing, and no love triangles - very refreshing, especially in a paranormal book! Overall, despite the fact that the book dragged quite a bit for me, I enjoyed it and I will likely continue with the series. I still haven't started this series but I keep hearing how amazing it is I'm really curious about it. I love the fact that there's no messing around with the romance I hate when they just drag it on for the sake of a book! Awesome review my dear! I liked this book, but if you're all about Irish folklore, you'll probably really like The Iron Druid Chronicles by Kevin Hearne. The first book, Hounded, is really funny and it's an urban fantasy series starring an adult male protagonist. So long as that doesn't bother you, you'll love him and his amazing Irish wolf hound!